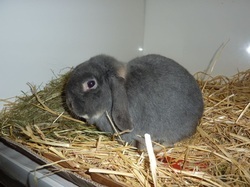 Earl came into the rescue on 9th January 2011 along with his son, Oreo. Earl’s owner thought that she had purchased 2 female rabbits, but Earl turned out to be a boy, so the female had an unwanted litter. His previous owner could not afford to get Earl neutered, so he was brought into rescue. Earl was neutered on 12th January 2011. When Earl came into the rescue he had a badly blocked tear duct, which was flushed by the vet when he was under anaesthetic at the time he was being neutered. He requires further veterinary care and treatment to completely clear the problem and will be available for rehoming once this is cured. Earl is a placid bunny, who is easy to handle.